The Library has made its Instruction Classroom (230, 2nd floor, 30 computers) available for anyone to come in an complete the training, which lasts approximately 45 minutes to 1 1/2 hours. You should bring ear buds or headphones as there are audio files to listen to (a limited supply of headphones are available for check-out from the Circulation Desk. 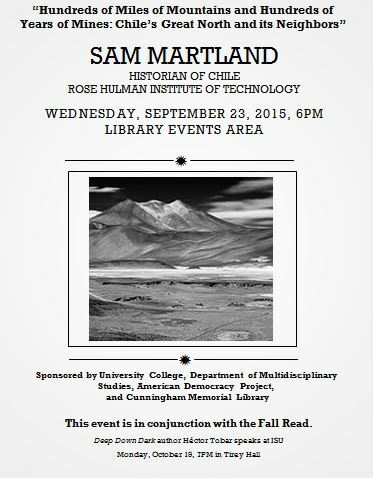 Friday, September 25: 4:00 p.m. to 6:00 p.m. This one-hour film chronicles the fate of the 33 miners trapped in a collapsed Chilean gold and copper mine in August 2010 and investigates the many challenges faced by both the miners and those working around the clock to bring them safely to the surface. NOVA was on-site at the San José mine in Chile by early September. Conferred special access, NOVA’s film crew interviewed engineers, NASA experts, medical personnel, and key figures from the companies that provided drills and crucial rescue equipment to give a more detailed scientific account of the unfolding events. The resulting film, using footage from the scene as well as advanced animation, showcases the extraordinary feats of engineering as well as the biological and geological factors inherent in the rescue. 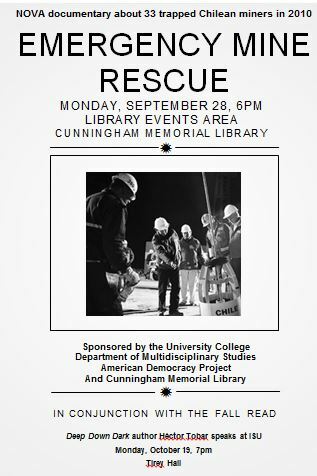 “Emergency Mine Rescue” also examines the psychological and physiological impact of this kind of prolonged ordeal on the miners and those involved in the rescue efforts. Wednesday, Sept. 9, @ 1-2:30 p.m.
Monday, Sept. 14, @ 11 a.m. -12:30 p.m.
EndNote is an invaluable and essential tool for those required to write and cite a lot and those involved in ongoing research projects.All ISU faculty, students, staff welcome. No RSVP necessary. Make the most of your research time and build a discipline-specific database of sources with EndNote. EndNote is a bibliographic management software designed to download, store, and manage bibliographic references in private desktop reference libraries. In this session, Reference/Instruction Librarian, Shelley Arvin, will demonstrate how to create an EndNote library, add and edit records, and search for and import bibliographic records. You will also learn how to make EndNote automatically format your bibliography and insert it into a manuscript in Microsoft Word. 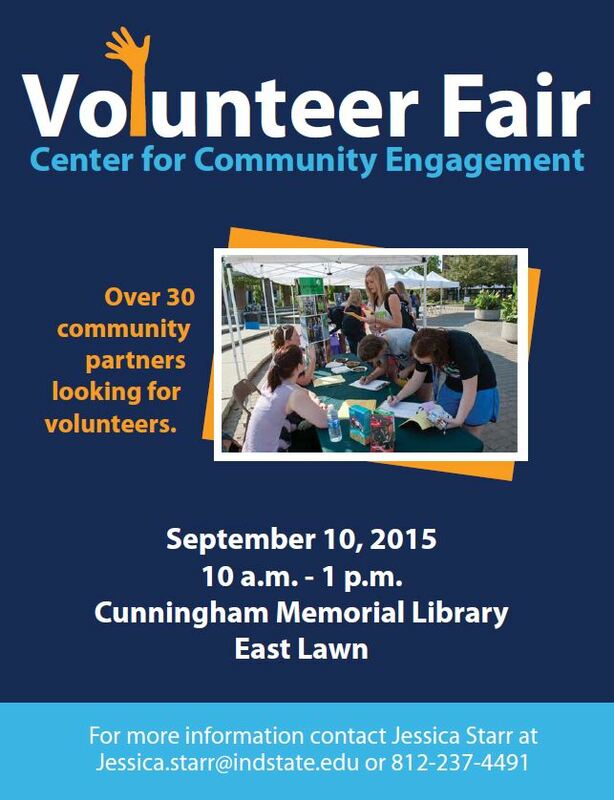 The Center for Community Engagement is sponsoring a Volunteer Fair in partnership with the Cunningham Memorial Library Extravaganza. Over 30 non-profit community partners will be in attendance discussing volunteer opportunities with their organizations. 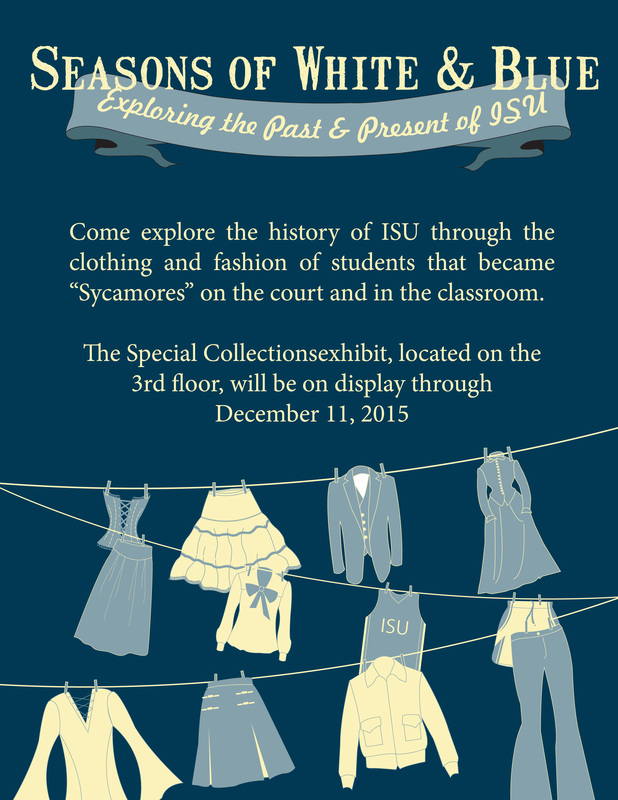 Come explore the history of ISU through the clothing and fashion of students that became “Sycamores” on the court and in the classroom. The Special Collections exhibit will be on display August 17 to December 11 on the 3rd floor of the Cunningham Memorial Library. To engage the increasing number of distance students, Special Collections also placed the exhibit online at http://omeka.indstate.edu/exhibits/show/seasonswhiteblue/introduction.